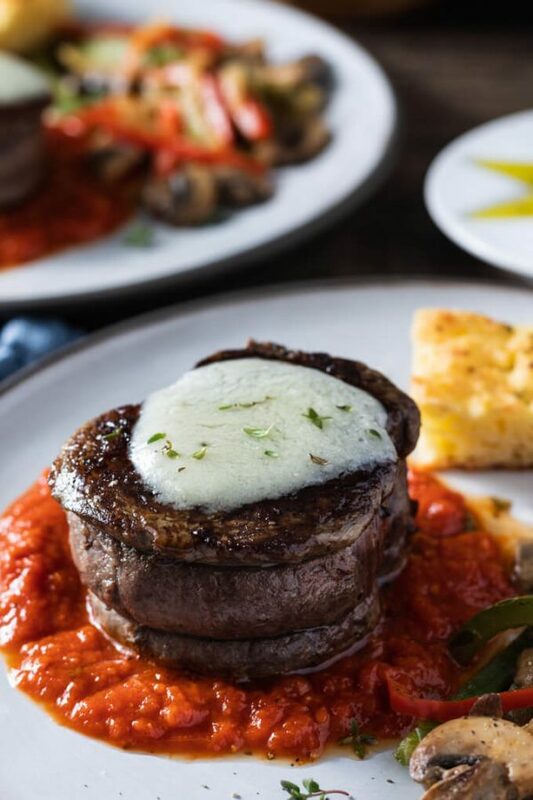 Tender filet mignon with garlic parmesan butter, zesty tomato sauce, and sautéed vegetables make steak pizzaiola feel new again in this great keto recipe. Every year I develop a delicious steak recipe for Valentine’s Day. 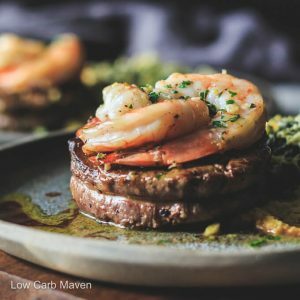 Last year I shared a delicious Steak and Shrimp Surf and Turf menu with spinach artichoke dip. 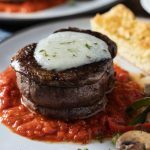 A few years ago I shared a delicious Filet Mignon with Mushroom Red Wine Sauce flavored with fresh thyme. This year, I developed two amazing recipes instead of one: this deconstructed Filet Mignon Steak Pizzaiola and a fantastic Seared Lamb Chops with Mint Sauce and rosemary roasted rutabagas. Both are stand-out dishes sure to make your significant other stand-up and take notice! 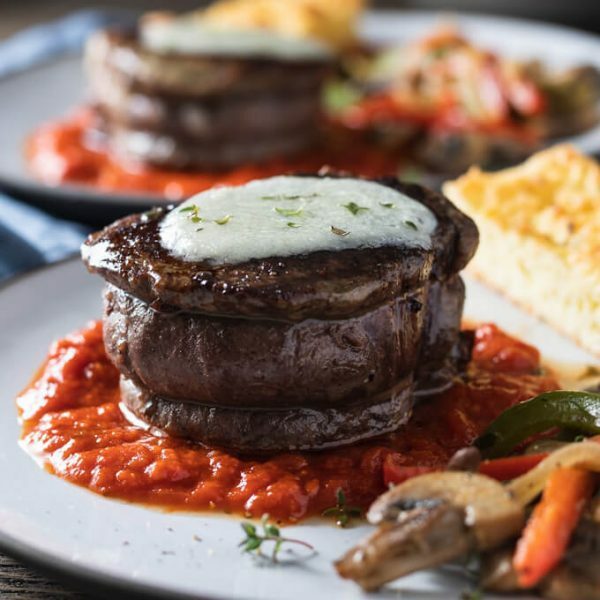 Steak pizzaiola is traditionally prepared by searing a less expensive cut of beef and braising it until tender, in a tomato sauce flavored with garlic and olive oil. Many Italian-American restaurants fill-out the dish with peppers, onions, and mushrooms. To expedite the dish, restaurants pan sear a nice piece of steak (like a NY strip), then quickly finish it in house red sauce. I, too, make my steak pizzaiola with peppers and mushrooms, but I have also seen recipes made with olives and even capers instead. Some people like to top their steak with Marinara sauce, mozzarella cheese, and pizza toppings. It’s all good. The best cut for braising is chuck. I love it, but make sure to cut off the extra fat. It’s awesome cooked in a slow cooker or even an instant pot. 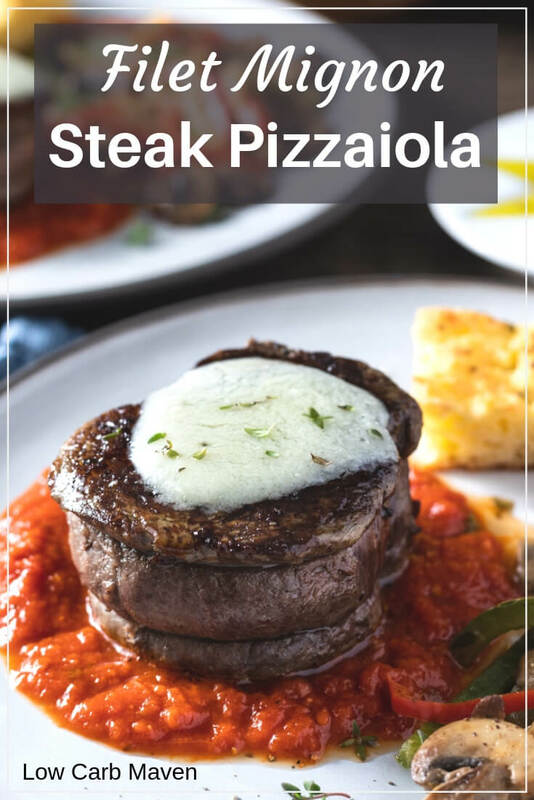 But, for a quick version I think the best steak for steak pizzaiola is New York Strip or RibEye. Both have nice flavor and can stand a few minutes in the sauce before getting too tough and dry. It’s best to pre-cook these steaks rare on the stove in a pan, then finish cooking them in the sauce. You can get all of those great tastes of this Italian-American classic by making this deconstructed version. 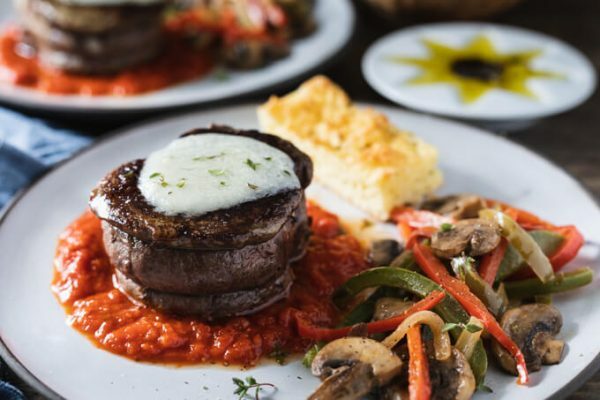 The filet mignon is flavored by a garlic parmesan compound butter. A good quality jarred sauce like Rao’s Arrabiatta is not only delicious but saves time. Thin strips of peppers and sliced mushrooms cook quickly while the steak rests. The whole meal comes together in about 30 minutes. NOTE: Advance preparation of the vegetables makes this dish go even faster. In a restaurant, steak pizzaiola is often served with pasta. Since this is a low carb blog, I served the peppers and mushrooms that would normally be in the sauce, as the side. A nice green salad with a vinaigrette dressing rounds out the meal without providing extra carbs. I suggest using an electronic oven-proof thermometer to cook your filet perfectly. If you don’t have a thermometer here is a guideline. 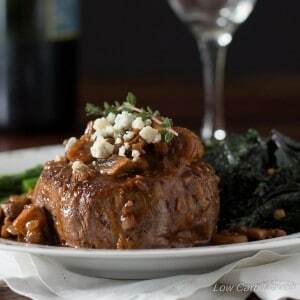 See a more detailed chart in my Filet Mignon with Mushroom Red Wine Sauce. Let the steaks come to room temperature for 30 minutes. If they try to spread out flat, use a piece of baking twine to gird them. (Tie it around the middle of the meat (like a belt) and made a knot.) Meanwhile slice the vegetables and make the Garlic Parmesan Butter. Preheat oven to 375 F and place rack to middle position. Mix the softened butter with the grated Parmesan cheese and grated garlic until completely combined. Spoon onto a piece of cling film and shape/roll into a log, using the cling film to help. Refrigerate until needed. Place an oven-safe frying pan over medium high heat. Rub the entire surface of each filet mignon with some of the olive oil. Salt and pepper all sides. Remember - protein loves salt. When the pan is hot (a drop of water will skip across the surface), add the remaining olive oil and quickly tilt the pan to distribute. Put the steaks in the pan and sear for 1 1/2 - 2 minutes (thinner steaks will take less time). Put the hot pan back on the stove over medium heat and add 1 Tbsp of olive oil, the onions, and the peppers. Saute the vegetables (stirring to prevent burning) for 2-3 minutes. Then, add the wine and mushrooms. Saute for 2-3 minutes more, stirring the fresh thyme into the vegetables at the very end. Remove to serving dish. Turn off the heat and add the red sauce to the pan to warm it up and pick up residual flavors. NOTE: If you enjoy larger meals, serve with a green salad. The bread in the photos is my Low Carb Focaccia recipe.